ltoscano set this project's color to Green. ltoscano created this object with edit policy "Custom Policy". ltoscano set this project's image to F5685461: fa-calendar-green.png. 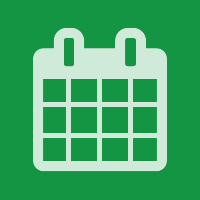 ltoscano updated this project's image from F5685461: fa-calendar-green.png to F5685462: fa-calendar-green.png.